Show Me The Movies: Review: Death of Stalin - Iannuccis serves up bleak yet amusing (and somewhat poignant) political comedy! Review: Death of Stalin - Iannuccis serves up bleak yet amusing (and somewhat poignant) political comedy! In a year of weak offerings comedywise, a Armando Iannucci penned and directed satirical political comedy was always going to be welcome to the cinema audiences. Add in such great comic actors as Jeffrey Tambor, Paul Whitehouse and Michael Palin and the likes of the iconic Steve Buscemi, and Jason Isaacs and the raw materials for a surge in comedic quality are all present. 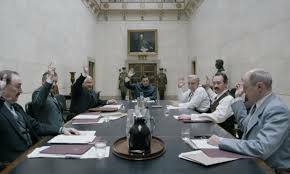 Whilst that may not have entirely been the case here, there is enough in Death of Stalin to please fans of good comedy as Iannucci pulls off the most unique of juggling acts in making this feature ruthlessly grim and hilariously funny at the same time. Adapted from French graphic novel by Fabien Nury and Thierry Robins this British/French co-production follows the Soviet dictator's last days and depicts the chaos of the regime after his death. Fans of the Thick of It and Veep will undoubtedly enjoy this farcical comedy and whilst it may not contain as many laugh at loud moments as those shows, it does contains darker and more subtle (yet equally as funny) moments that work very well due to an exceptional cast obviously relishing their respective roles. Simon Russell Beale as Beria, Steve Buscemi as Khruschev and Jeffery Tambor as Malenkov all excel but it is Jason Isaacs cameo as Zhukov that was the highlight for me, primarily as all his lines were delivered in a thick Brummie accent only adding to the hilarity. This decision by Iannucci to use the actors original accents is a masterstroke and adds very well to the humour throughout. The film purrs along nicely a smooth blend of Iannucci's unique vision delivered in Pythonesque style with absurdity prevailing throughout! Overall, Iannaucci with the assistance of an experienced and incredible cast deliver an outrageous and bleak yet hilarious comedy that is painfully close to the bone in similarity with current world politics but ultimately will go down as a high in a year of comedy lows at the box office!